As you can see by the big grin on my face in the photo below our weather in central Texas has finally felt a bit more like fall in recent weeks. And that means that I can cycle at something other than the crack of dawn (or at least pretty early in the morning) to avoid the oppressive Texas heat. While this particular bike ride in the photo was out in the Texas hill country earlier in October we’ve generally had some pretty good weekends for cycling throughout October. While I’ve backdated this post I’m actually writing this toward the end of October on the 29th. This weekend and particularly today, the 29th, was superb for getting outdoors and cycling. I did a city ride of around 24 miles today and it was a perfect day to be out. As I write this the day finishes with mid 70s and abundant sun. You gotta love fall weather in Texas. 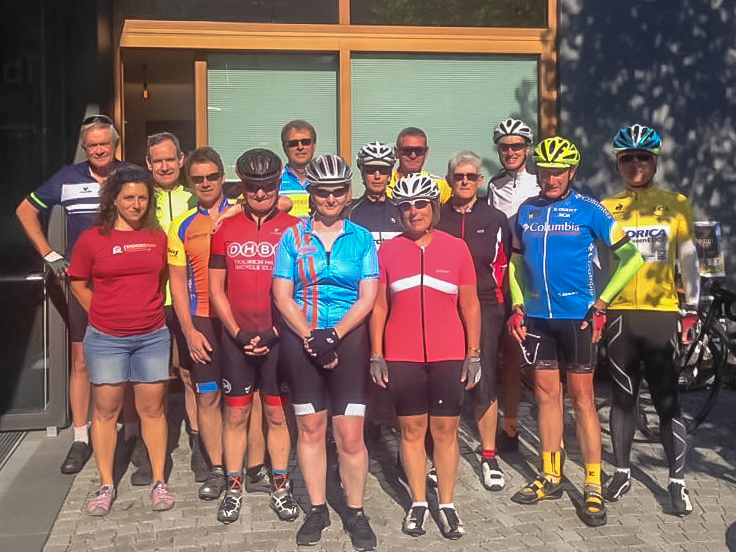 After my recent bike tour I spent a few days in Lucern, Switzerland. Or, as my title would suggest: Lucerne or Luzern. The city names all seem to be interchangeable and it all depends on what you’re reading. The train station is ‘Luzern’ and that’s pretty official! Google maps will find them all. The photo I put at the top is one among my favs of my short visit but I must have taken hundreds between the lake view and the mountain hikes and in between. This shot was taken from the back of one of the many tour boats that ply the lake all day long. The gulls like to follow them as the boats take off and churn up the water. I have made a short visit to Lucern in the past but it was long ago. Almost 20 years ago. What I remembered was that it was a very beautiful spot and so I wanted to return for a short stay before heading home via Zurich, an hour away. My hotel stay for the duration turned out to be just right for me. I snagged the photo of the hotel along the way. When I say ‘just right’ it turned out to have some things that I really liked: first among them was that I could drive up and park right next to it since I had a car, and they had parking. Then (as planned) I had booked a lake side room and even though the [single] room was ridiculously small it had all I needed AND the little balcony. I could sit for hours just having the door open to that balcony and watch the world below go by. The weather changed by the minute. The boats came and went. So despite the crackerbox room, the ability to enjoy the view from that perch was worth the 4-star price of admission. 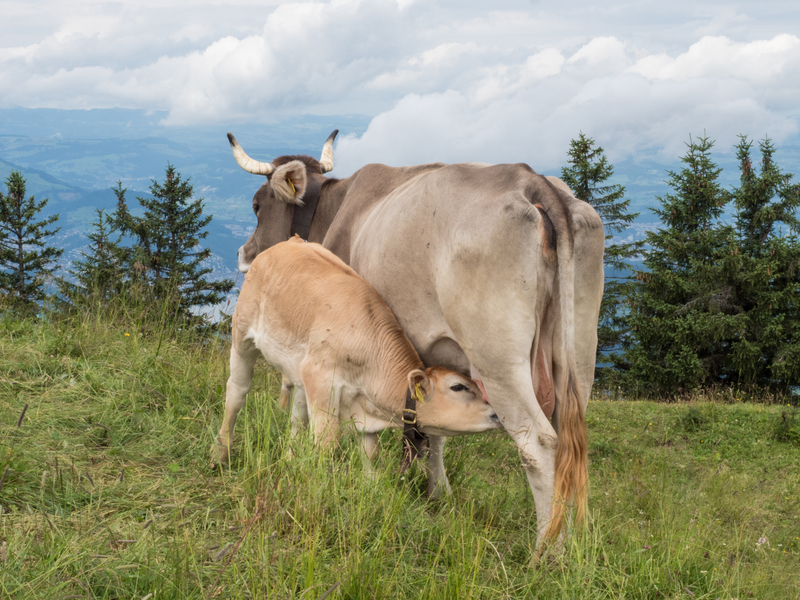 On my first full day in Lucern I was up early and arranged to make my way to nearby Mt Rigi. The plan was to get to the top while the morning sun was still allowing great views and then hike. 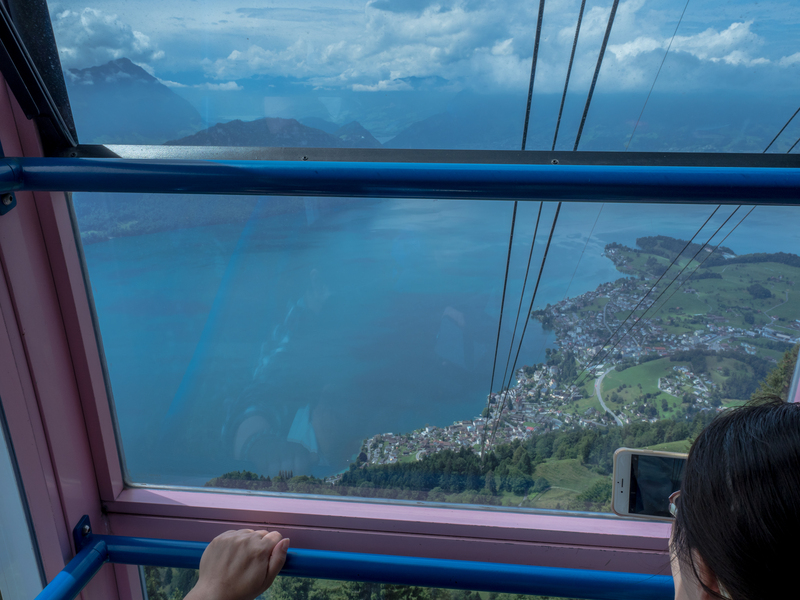 I chose to take advantage of the well established tourist route to the top of Rigi: I booked a round trip via the Vierwaldstättersee to the top of Rigi. 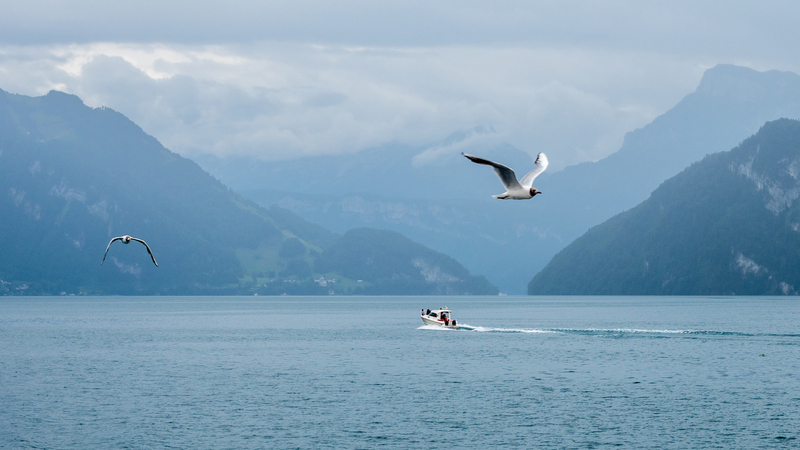 What that implied was the following itinerary: 1st, that you take a lovely boat ride down the lake to Vitznau and from there, a cogwheel train up to the very top of Mt Rigi at around 5900 ft above sea level. 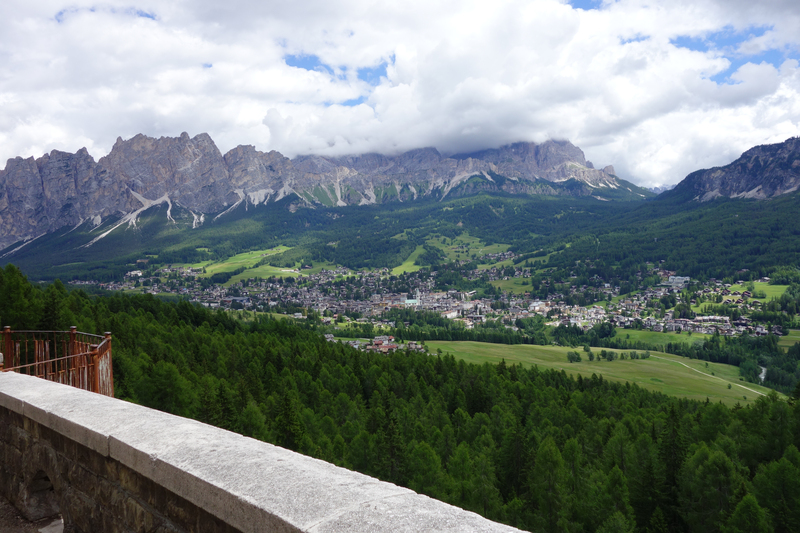 One of the photos I have here is of the gondola ride back down later. It’s stunning to me the height at which you descend. I have no idea how high up it is but let’s just say I’m thrilled that it was in a glassed in gondola and not just open to the air. It’s frighteningly high. Once at the top I chose to hike for a good chunk of the way back down. It’s not surprisingly very pretty. And based on the rains that seem to come a bit every day, very verdant. 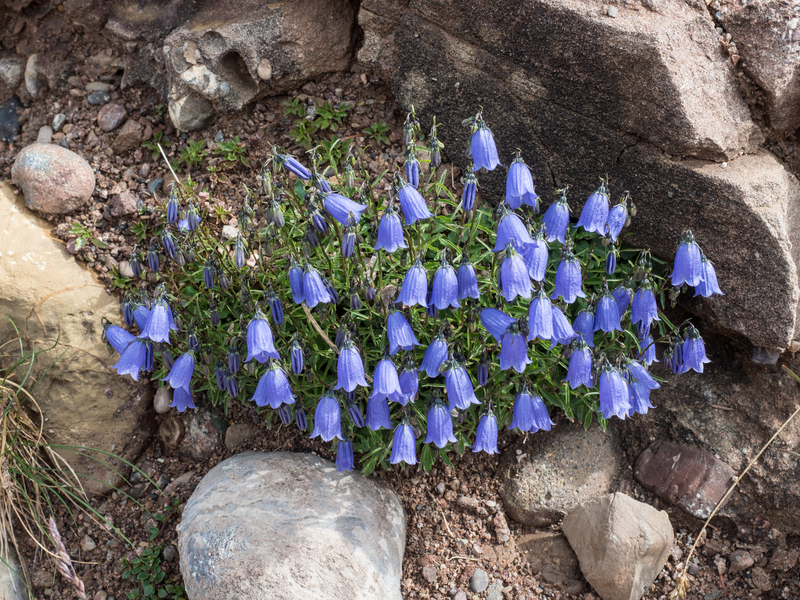 There were also lovely flowers clinging to the rocky mountain trail. I don’t know the names of these but I loved the blue ones I have posted here. 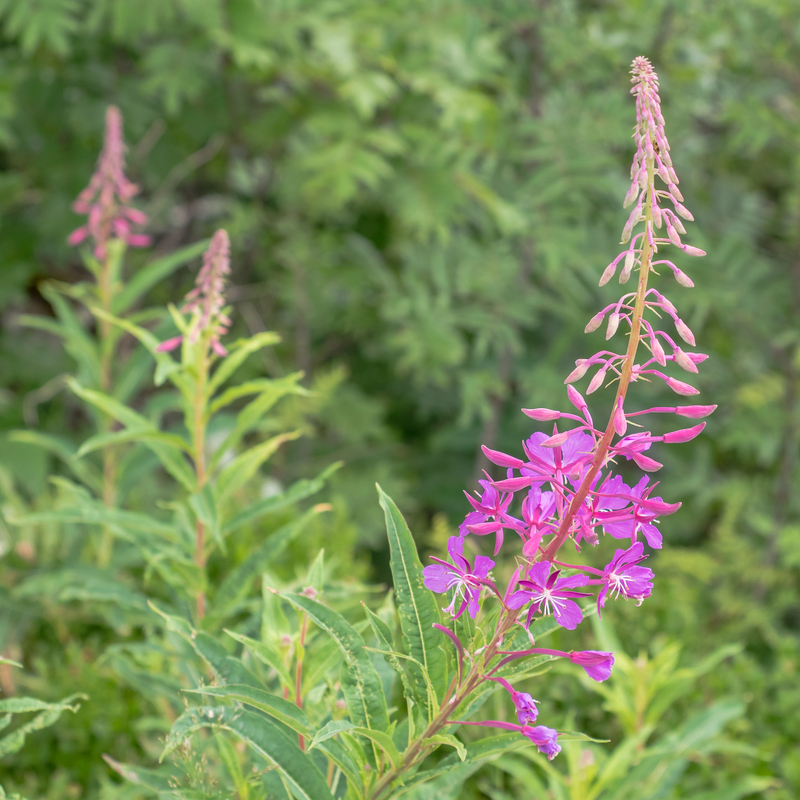 There were many flowers along the way. The ones above and the one I have below were just a couple of the many along the trail back down. These are just a couple of my favs. 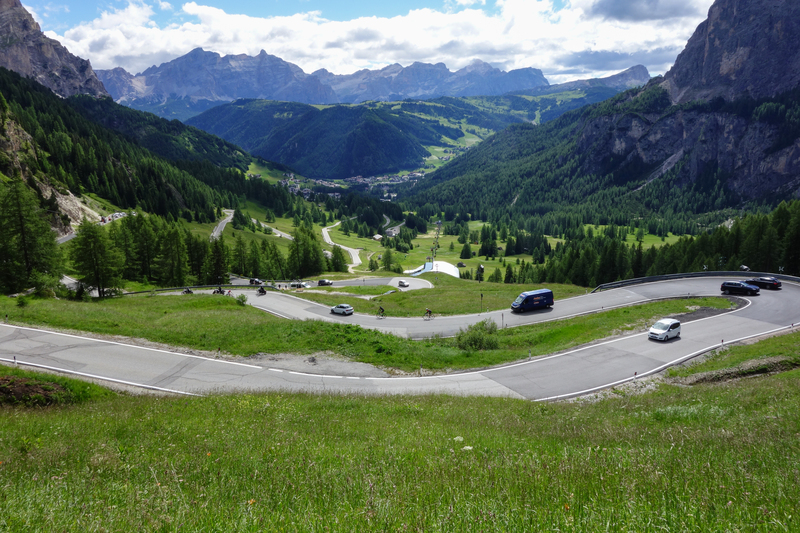 Choosing to take the cogwheel trail all the way to the top and then hike down is, trust me, a winning strategy. It’s a long way up! (i.e. aroudn 5900 feet) and to walk up would be interesting for sure but also a big undertaking. Keep in mind I’d just finished a bike tour. The hiking I factored in could be classified as ‘easy’ hiking. Toward the very top of Rigi I encountered these cows just off the trail. Most of the cows you saw along the trail were in distance so these so close were pretty cool. Many of the cows wear a big bell around their neck. I’m not sure why it’s not all of the cows but it definitely seems to be only some of the cows. Anyway, it makes a lotta noise! For people like me that don’t hear this often it’s kinda charming. But between the cow bells and the church bells ringing through the day in this neck of the woods you’d hard pressed not to have bells ringing in your head day and night. As enjoyable as it is as a tourist I gotta figure the locals just tune it out – but I’m sure it does serve a purpose for finding these critters up in the mountains. I took a similar day hike up a different mountain on another day after this one and may post some of those photos and notes too but the full day on Rigi is one not to be missed if the weather allows it! I’m backdating this post so it’ll be a little odd that I’m referencing a New York Times article “Venice, Invaded by Tourists, Risks Becoming ‘Disneyland on the Sea’” that was published in early August 2017, and yet I thought it better to date the post when I actually visited. 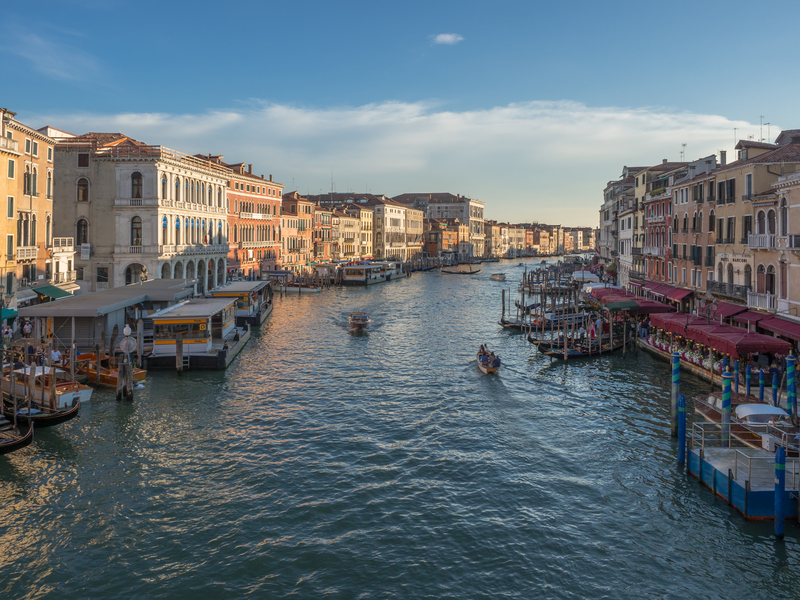 The NY Times article was, however, pretty interesting for perhaps no other reason than it highlights just how much of a tourist haven that Venice has become. And even more so because they refer to it as Disneyland. This was exactly my thought after arriving in the city. It’s just so picture perfect. And speaking of pictures, I took many photos during my short 3 day stay in Venice but I have only posted 3 of my favorites here. The top photo was taken late in the day from the Rialto Bridge. There are only four bridges across the Grand Canal and as you might imagine given the tourists they are all pretty heavily traveled. No doubt I had to almost muscle my way to the edge of the bridge to take this photo. Despite the overall negative tone of the NY Times article and how the city is overrun with tourists, I still found the city an enchanting place to hang out for a few days. 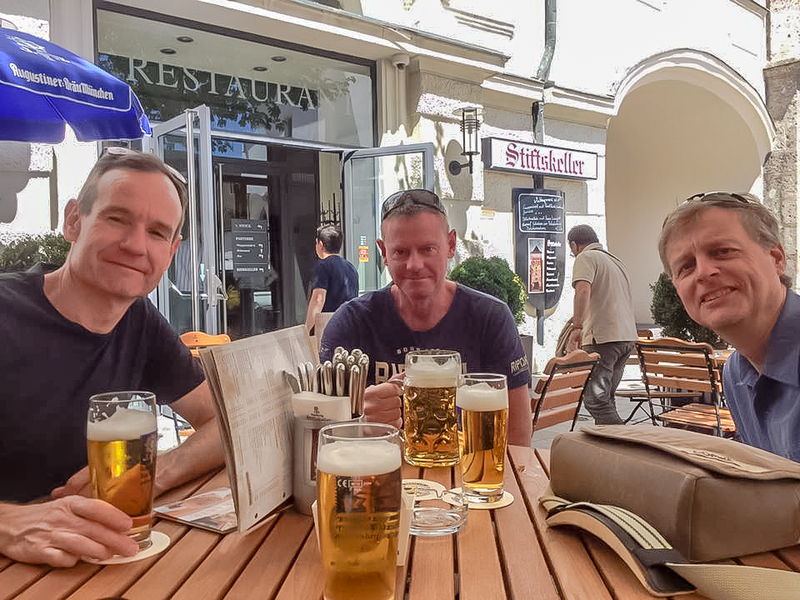 I arrived jet lagged to hang out before beginning a bike tour that would leave from very near the heart of the city. And yes, I did find the city crowded with tourists but having been to the city only once before – and back in the early 90s – I would have to say it didn’t seem any worse or different. On that particular occasion I was most certainly a day tripper arriving on the train from Milan. The city was jammed with people as I recall and it was the same this time. That said, it was not hard to wander away from the main places like the Rialto Bridge and Piazza San Marco and find that crush of crowds was diminished. 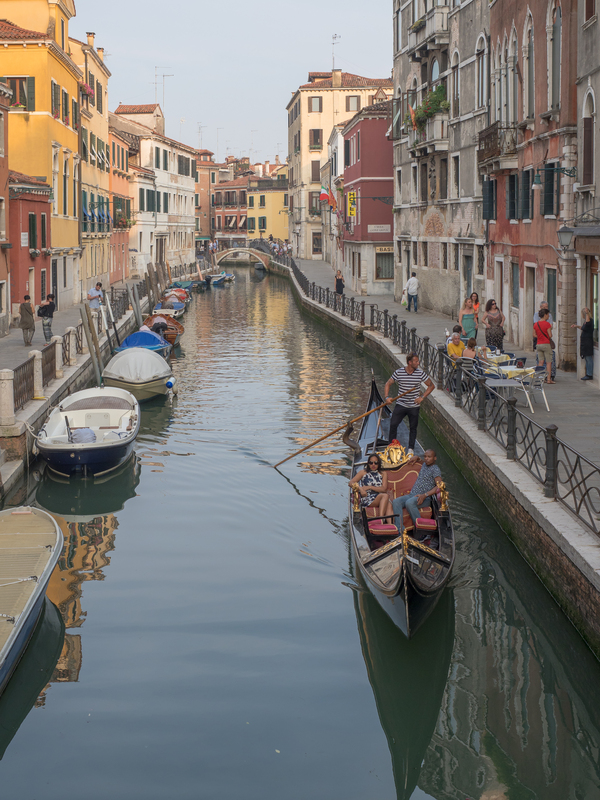 Case in point … The photo I have here of the gondolier rowing up one of the many side canals that are everywhere throughout the city. Note how few people are along the streets next to the this canal. You could find similar throughout the city. Quiet spots with wonderful views and sights to see. 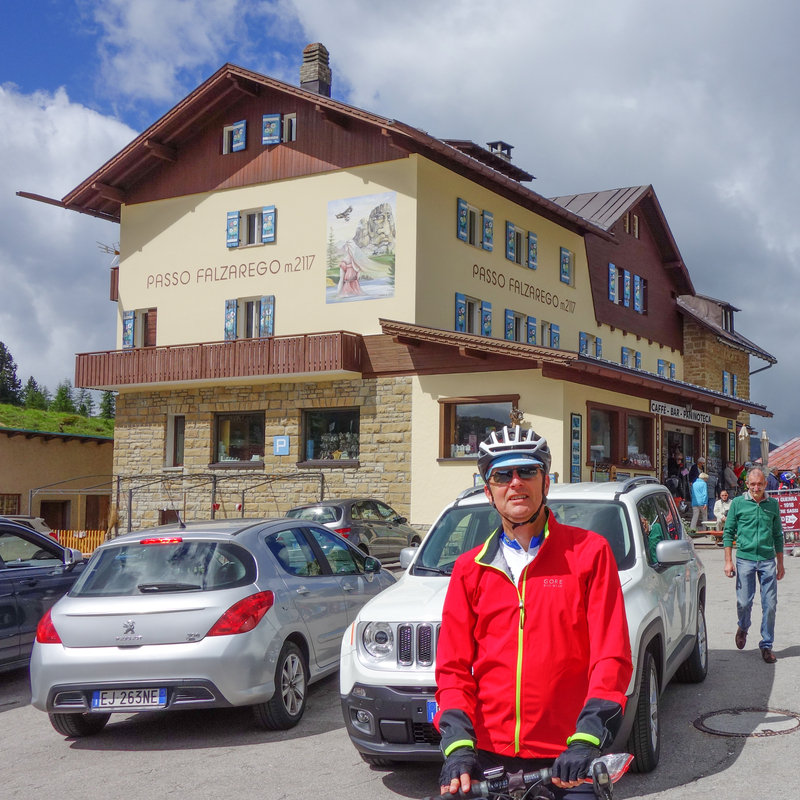 If it had not been for the bike tour I was joining, Venice would probably not have been high on my list of destinations. It’s beautiful of course and I thoroughly enjoyed the visit but I’ve been once long ago – and half the charm is the city hasn’t changed all that much in centuries – and if I were to go again I’d rather have someone join me. This next photo was taken from one of the Vaporetto that ply the Grand Canal day and night. You do get a sense of the tourist crowd on the Vaporettos for sure. These are basically water buses that go up and down the canal and they are very handy but also packed. It was standing room only and given the temp was quite warm I was fine with that because I would find a place up near the front of the boat to catch the breeze. 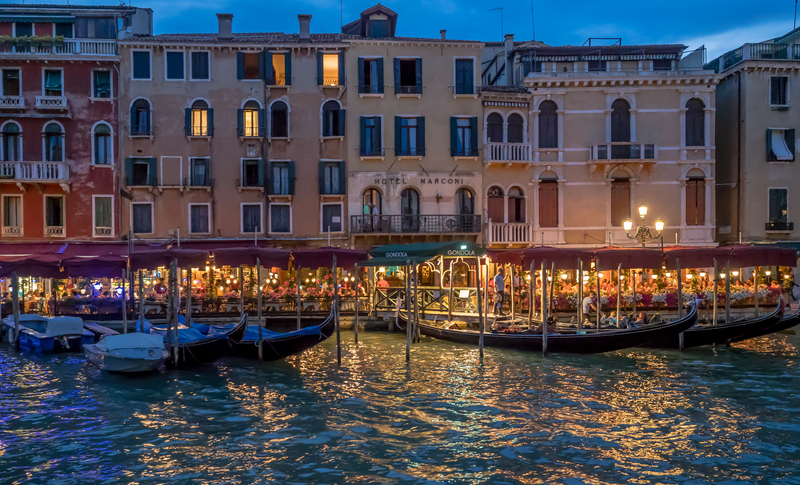 I liked this photo in part because of the reflected light but also the brisk business of restaurants and the gondoliers along the Grand Canal. Thought I’d finish up this post with a few notes about logistics for a visit to Venice. If nothing else, I may be able to refer back to this if I ever plan to go again. Years ago I had arrived by train. This time though I flew into the local airport. The airport is actually a pretty good distance from the old island city. You have options to get into the city but the main ones are to either to take the bus (low cost), take a regular taxi (car, mid cost) or to take a water taxi (high cost). There may be others … I used this website and found it to be very helpful. After having traveled over night I was not interested in waiting whatever amount of time it might take for the bus into the city so I opted to take a taxi to the main jump off point of the city, Piazzale Roma. The buses arrive at the same place. And so do the trains for that matter. If you bus or taxi the way I did to Roma you still have to make it to your hotel destination. There are again options but I simply chose to hoof it. The advantage of taking a water taxi from the airport is you would typically not have to worry about the 2nd leg. The water taxi could very likely take you within steps of your hotel. But it’s also probably > 100 Euro for the one way trip. 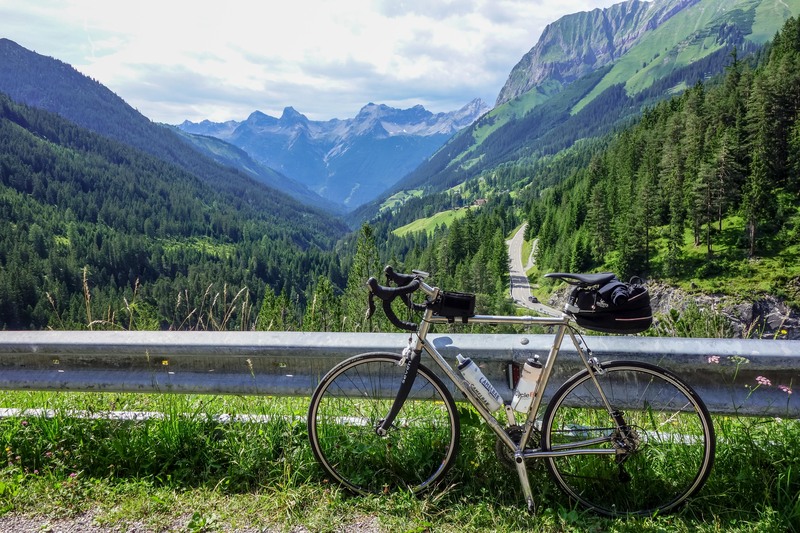 Traveling with bike gear – including a bike – I left almost all of it behind at the airport at “left luggage”. 7 Euro per bag for 24 hours. (2017 prices). Worth the cost. There’s absolutely no reason to take large luggage into the city of Venice. Travel as light as possible into the city. I took only a backpack and lived out of it for 3 days just fine. One last note about traveling around once you arrive. The Vaporettos are so easy and so frequent you have to use them. Basically a bus on water, they allow for a multi day pass you can buy. Online notes like you find at http://europeforvisitors.com/venice/articles/buying-vaporetto-tickets.htm are great and yet what it doesn’t tell you is you can also avoid any lines to buy a ticket and just do it all online using a mobile phone app. I got the app and bought via it and never had a problem. The only tricky bit was that few of the many Vaporetto stations actually have a QR Code reader so you just get on the boat and ignore it. For those (main) stations that have a reader you just skip the line and hold your phone showing the code under the reader and the gate opens like magic. All aboard! 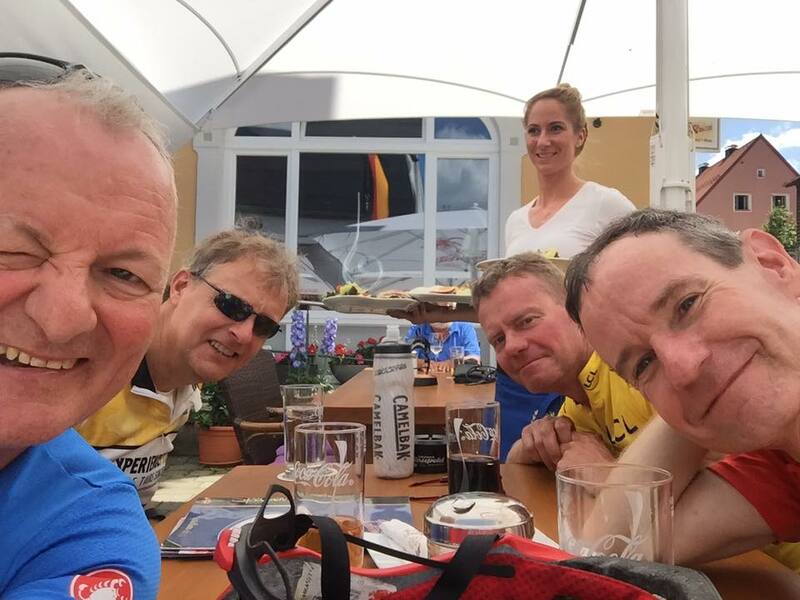 Bike Tour – Ready Yet? Around Christmas time I was pretty set on doing an interesting bike tour once summer rolled around. I found one that fit the ‘interesting’ criteria and where the timing would pretty well suit as well. And so, I’ve been trying to routinely ride since then. 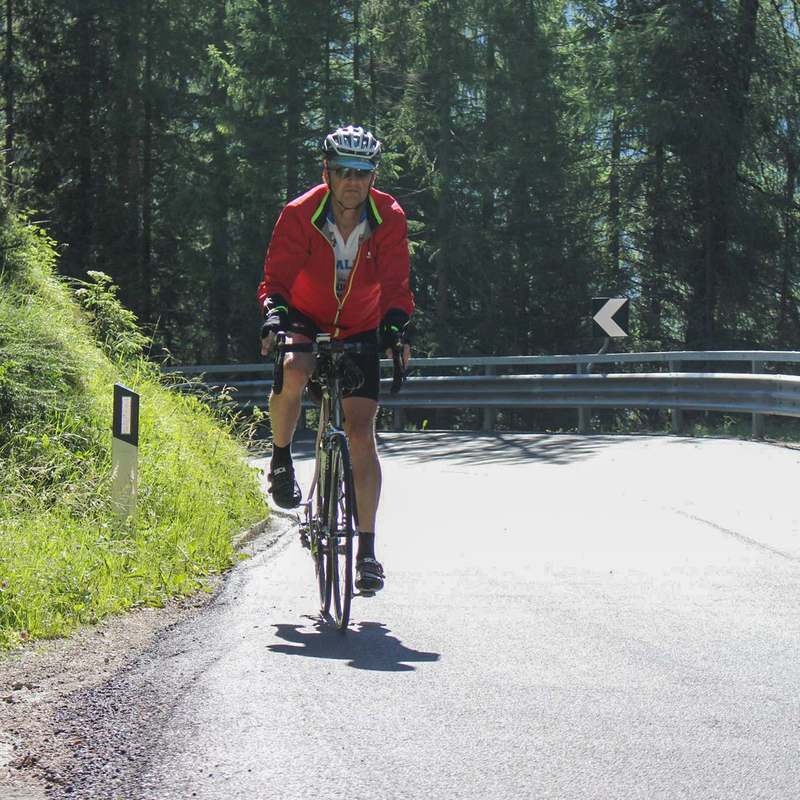 Nothing like planning a bike tour to motivate you to get out on your bike! On many of my rides since Christmas I’ve had a Garmin device on the bike. Perhaps the majority of the rides – but not all of them. But I found it pretty interesting that the Garmin website had a calendar view that identified the days that you had logged a ride. You can see a screen shot of the calendar in this post. 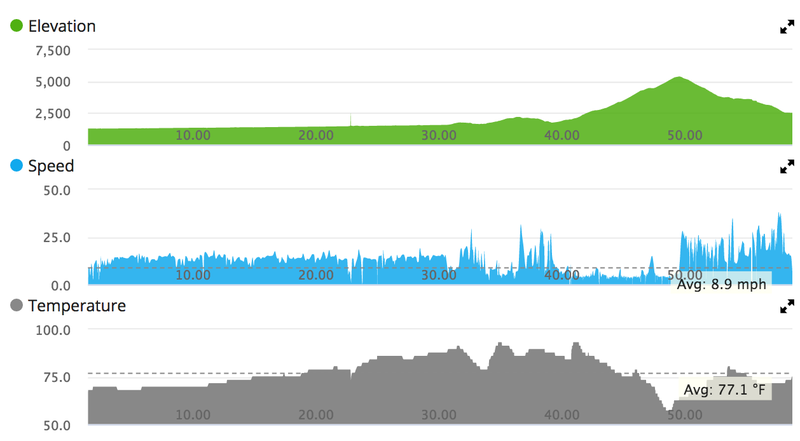 Seems pretty clear that the time I get a chance to ride has mostly been on the weekends. But I’ve tried to step it up a bit and get in some mid week rides at the end of the work day as well. It’s been easier to do that after Daylight Saving Time kicked in, and while we haven’t gotten into the truly hot weather of central Texas. If I can keep a similar routine up I hope it’ll make the tour more enjoyable. We took time out over the Memorial Day holiday weekend to head out into the Texas Hill Country to enjoy some wine tasting at a couple of really great Texas wineries. ‘Wine Country’ in this part of the world often implies just one stretch of highway 290 between Johnson City and Fredericksburg, TX. (About an hour+ west of Austin.) And indeed these two wineries were 10 minutes apart on that very stretch of road around Stonewall. That so many wineries have popped up in that area is no surprise. Fredericksburg is very popular and that stretch of road is highly trafficked. 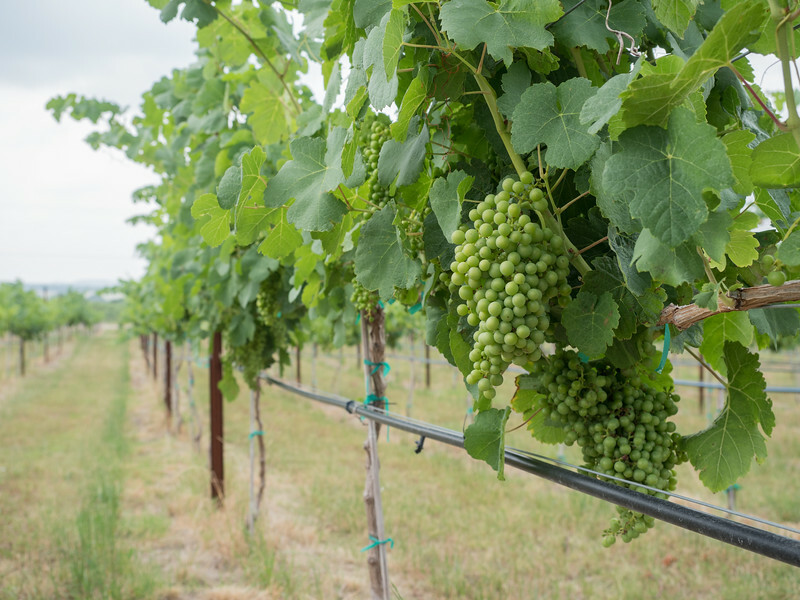 But in reality, while there are grapes growing in the area and on the estates, much if not most of the fruit in Texas wine comes from the ‘high plains’ – up near Lubbock. Soil and temp conditions are just better up there. But… nobody goes up there if they can avoid it so consequently the wine biz has set up shop in central TX. They do grow fruit in the hill country though and have for ages … but most of it used to be peaches. There are still peaches of course but now there’s a lot more vines and grapes. This visit out that way was mainly to catch a [relative] newcomer to the area. Kuhlman Cellars has only been there a couple of years, and yet judging by the quality of the wine, you’d never know that. I was throughly impressed with the experience. You need a reservation for a tasting at Kulhman and if same-day, you can call them. In this case though I made the reservation online the day before. That was handy. I got the “Signature Food and Wine Pairing”. It’s the way to go I think. It was a few bucks more but the food pairings were a nice addition and enhanced the experience. The tasting was a sit-down event and just about right on time per the reservation. 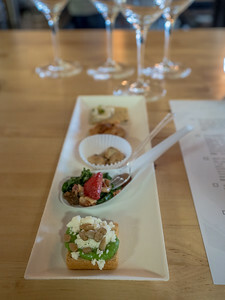 A sit-down tasting / pairing isn’t something I see often at hill country wineries but I really liked it. I snapped a shot of the food pairings which you can see here in this post. We were ably guided through our tasting by Jeremy Wilson. Follow the link to his blog postings at the Kuhlman Cellars blog. By his description, his job is essentially anything that needs to get done. From planting in the vineyard to driving the forklift – but he really likes doing the tastings and explaining everything. He’s very knowledgable about the regional wines. We were fortunate enough to also briefly meet and say hello to the winemaker Bénédicte Rhyne. She’s originally from France. Her mom was visiting from France and was there that afternoon for a tasting, which was kinda cute. Follow the link for a bio. There were 5 wines tasted and I enjoyed each. The Sauvignon Blanc was a surprise and very nice. “Green apple, pear and gooseberry.. crisp acidity”. You’d never guess the fruit came from Ft Stockton way out in west TX. The reds in general were lovely but the 2014 Barranca was a standout. Tasting notes: “violets, sweet baking spice, cedar cigar box and cherry, .., dark chocolate, creme fraiche and intense mineralogy”. (I’m always amazed at how wine writers come up with these descriptions.) Anyway, it was 31% Mourvedre, 30% Tempranillo, 24% Malbec and 15% Sangiovese .. and it was yummy. Pricey at $36/bottle but as things go this is pretty much a specialty item and nicely done at that so you’ll pay a little more. The photo at the bottom of the post of the vines and grapes is, if my notes are correct, Marsanne. You can read all about this at the winery’s own blog post here. With plenty of time left of the afternoon we decided to also take in Hilmy Cellars 10 min down the road. I had been there only once and was impressed with their wines. So, off we went. You can see another couple photos here from Hilmy. The first is one is of their 2015 Persephone. A blend of 2/3 Viognier and 1/3 Chenin Blanc. The white wines in general at Hilmy were excellent. My fav was their 2015 100% Viognier. A bit more floral than the other two white but with enough acid not to make it cloying. The guy in the photo at the bottom is Michael at Hilmy. Didn’t catch his last name. He’s only been in the area for 3 months. He moved from California. He was very knowledgable about the wines though and as you can see, he clearly enjoys what he’s doing. The Willamette Valley came to Austin – at least for one night. 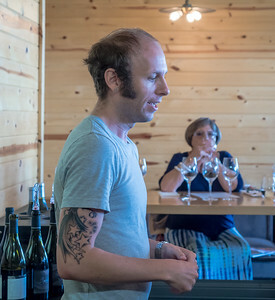 I’m a big fan of Oregon wines and have written here before about visits up there. 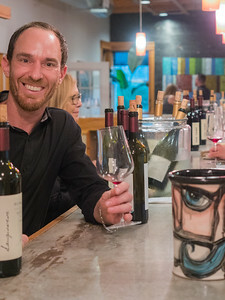 So I was excited to see an event called “Pinot in the City” come up right here in Austin that showcased nothing but Oregon wines from the Willamette valley area. First and foremost I appreciated that the organizers somehow managed to make the winery to taster ratio a very good one so that we weren’t all just packed in there like sardines and making it difficult to get a tasting. 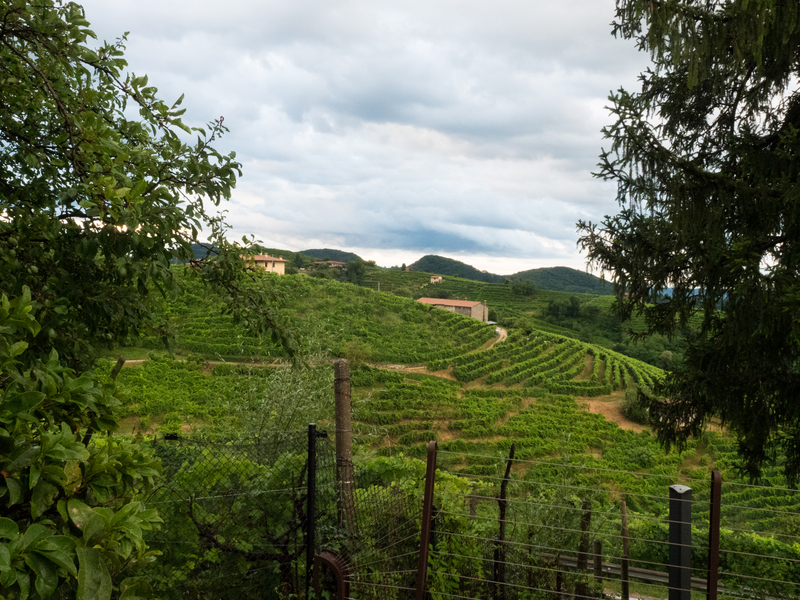 In fact, it was a pleasure to just take our time, have a bit of food and then go check out the next winery that looked interesting. In the end, I made note of my two favorites. One white and one red. Perhaps not surprisingly these came from two wineries I have visited in the past. And while these I noted as my favorites, there was nothing that I didn’t like. 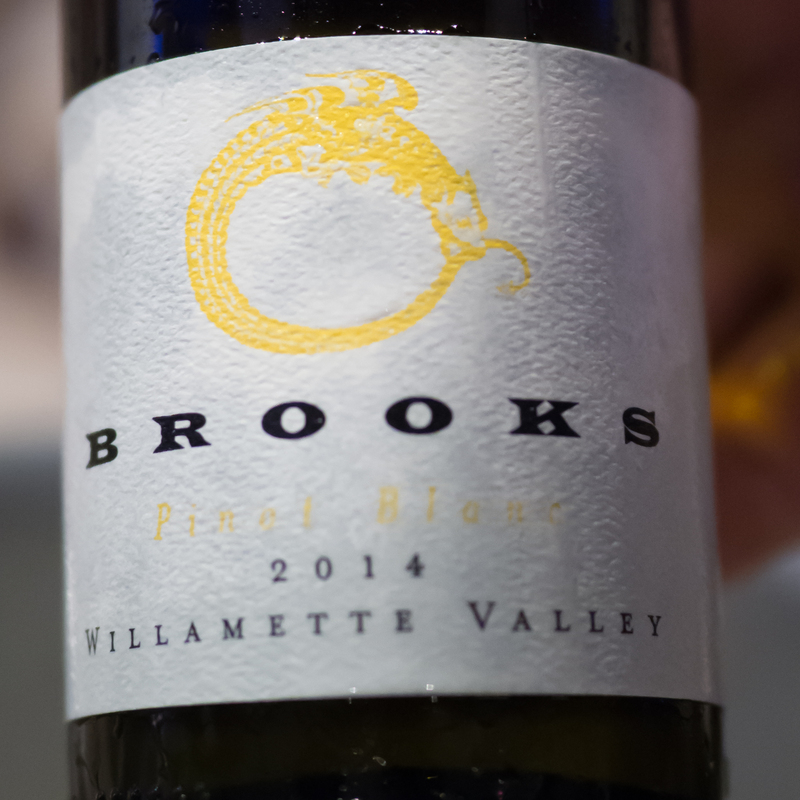 The first of these was the Pinot Blanc from Brooks. When I saw they had a white I at first assumed it’d be a Riesling. They make excellent Riesling! But instead it was this 2014 Pinot Blanc. Lemon lime with a round and reasonably full body. I’d love to find some more of this. I don’t see this particular year available on the Brooks website but they have the 2015 there. Might have to give that one a try. 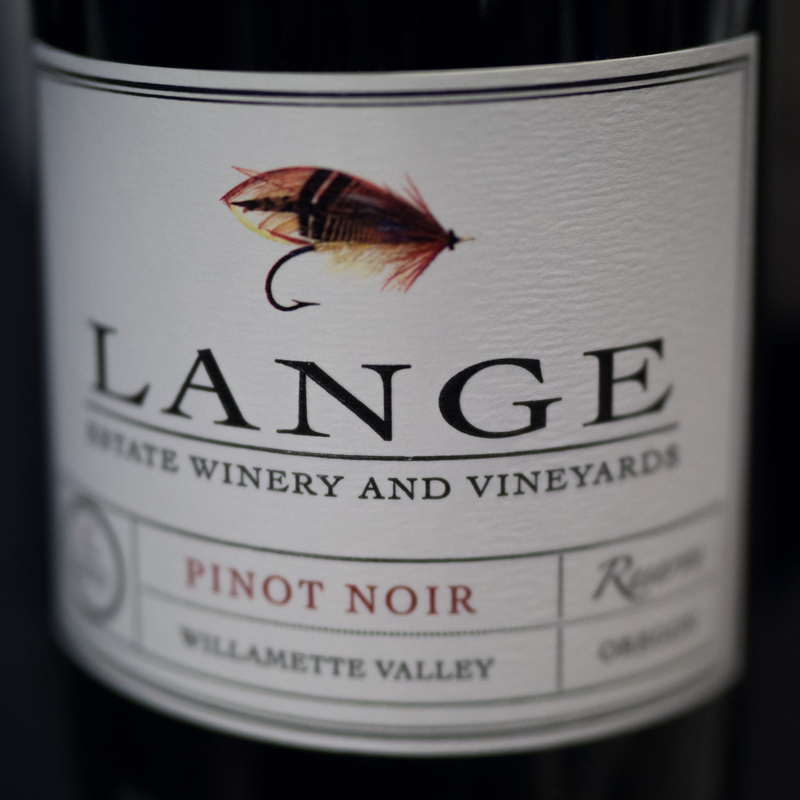 Lange is a lovely little winery to visit I might add. I have been there at least a couple times and hope to visit again one day.